Electromagnetic fields (EMF) are emitted by many natural and man-made sources that play important roles in daily life. More than 3 billion people across the world are exposed to EMF every day . Lifetime exposure to EMF is becoming the subject of significant scientific investigation since it has the potential to cause crucial changes and deleterious effects in biological systems. The biological impacts of EMF can be classified as thermal and non-thermal. Thermal effects are associated with the heat created by EMFs in a certain area. This mechanism occurs via an alteration in temperature deriving from radiofrequency (RF) fields. It is possible that every interaction between RF fields and living tissues causes an energy transfer resulting in a rise in temperature. The skin and other superficial tissues usually absorb the non-thermal radiations emitted by mobile phones; this causes the insignificant increase of temperature of the brain or other organs in the body . Nonthermal mechanisms are those that are not directly associated with this temperature change but rather to some other changes in the tissues in association with the amount of energy absorbed ,. Studies on the health effects of RF energy from communication systems have revealed that non-thermal effects should also be discussed. The fact that the possible biophysical mechanisms of RF-EMF interaction with living cells have not yet been fully elucidated is one of the reasons for these discussions . A significant part of many studies concerning EMF have investigated the “non-thermal” effects of RF on biological tissues ,. It has been observed that this effect is mediated by generation of reactive oxygen species (ROS) . ROS are involved in various cellular functions. They can be essential or extremely toxic to cellular homeostasis . Their cytotoxic effects derive from peroxidation of membrane phospholipids. This creates a change in the conductivity of the membrane and loss of membrane integrity . Exposure to EMF has been observed to cause increased free radical production in the cellular environment. Living organisms have anti-oxidative mechanisms, such as glutathione (GSH), glutathione peroxidase (GPx), catalase (CAT), and superoxide dismutase (SOD), in order to alleviate the damage caused by ROS and their products . This defense mechanism acts by suppressing or impairing the chain reaction triggered by ROS. In this case, antioxidant defense mechanisms are impaired by being subjected to an agent that causes overproduction of ROS, including EMF, thus resulting in oxidative stress ,. Studies in recent years have reported that free radicals play a major role in the mechanism behind many diseases, such as diabetes and cancer ,,. However, there is still much uncertainty on the subject, and several questions remain to be answered. This review evaluated the effect of exposure to EMF on biological tissues by concentrating on alterations in several antioxidant enzyme activities and different parameters of oxidation. A wide spectrum of electromagnetic waves are today emitted by radar, communication equipment, mobile phone base stations, high voltage lines, radio and television transmitters, substations, and electrical equipment at home and work, in addition to many electrical systems in the environment . The Global System for Mobile Communications (GSM, 850–900 MHz and 1850–1990 MHz) is currently the most extensive system for mobile telecommunications worldwide ,. The mobile phone models (1800 MHz −2200 MHz), laptops (1000 MHz–3600 MHz) and wireless networks in use today function with high frequency (2.45 GHz) microwave radiation . In parallel to technological developments in this century, technological devices are becoming ever more important in daily life. However, despite making life easier, they may also cause a number of health problems. In particular, the average age of beginning mobile phone use has decreased rapidly to elementary school age, and durations of exposure to EMF are also increasing. One study reported that extremely low exposure to EMF from mobile phones may cause health problems . Several studies have reported findings such as stress, headache, tiredness, anxiety, decreased learning potential, impairment in cognitive functions and poor concentration in case of exposure to microwave radiation emitted from mobile phones ,,. EMFs influence metabolic processes in the human body and exert various biological effects on cells through a range of mechanisms. EMF disrupts the chemical structures of tissue since a high degree electromagnetic energy absorption can change the electric current in the body . As a result of this exposure, the functions of organs are affected. Electric fields exert an oscillatory force on every free ion on the both sides of the plasma membrane and cause them to cross it. This movement of ions causes deterioration in the ion channels on the membrane, biochemical changes in the membrane and consequently impairment of all cellular functions . Exposure to EMFs can damage biological tissues by inducing changes, which can be explained in terms of thermal or non-thermal mechanisms . Thermal effects can occur with the conversion and absorption of heat by the body's electromagnetic energy. Increased body temperature is stabilized and alleviated by blood circulation. Although non-thermal effects do not raise the body temperature sufficiently to impair the structure of tissues, their effects can still be seen as an increase in free radical production in tissues . EMFs, no matter where they occur in the frequency spectrum, are reported to causes a rise in levels of oxygen free radicals in an experimental environment in plants and humans . Free radicals are reactive molecules produced during the conversion of foods into energy through oxygen. The formation of free radicals is an oxidation reaction that occurs on an oxygen basis. . Since oxygen is essential for survival, the formation of free radicals cannot be avoided. However, factors including ionizing and non-ionizing radiation alter the transcription and translation of genes such as JUN, HSP 70 and MYC, via the epidermal growth factor receptor EGFR-ras, leading to the generation of ROS , and resulting in the overproduction of ROS in tissues . The Fenton reaction is a catalytic process that converts hydrogen peroxide, a product of mitochondrial oxidative respiration, into a highly toxic hydroxyl free radical. Some studies have suggested that EMF is another mechanism through the Fenton reaction, suggesting that it promotes free radical activity in cells ,. Although some researchers have reported that ROS perform beneficial function, a high degree of ROS production may cause cellular damage, resulting in a range of diseases. These radicals react with various biomolecules, including DNA [Figure 1]. Namely, the energy of free radicals is not enough, and for this reason they behave like robbers who seize energy from other cells and rob a person to satisfy themselves . Many studies have suggested that EMF may trigger the formation of reactive oxygen species in exposed cells in vitro ,,, and in vivo ,,. The initial stage of the ROS production in the presence of RF is controlled by the NADPH oxidase enzyme located in the plasma membrane. Consequently, ROS activate matrix metalloproteases, thereby initiating intracellular signaling cascades to warn the nucleus of the presence of external stimulation. These changes in transcription and protein expression are observed after RF exposure . Kazemi et al. investigated the effect of exposure to 900-MHz on the induction of oxidative stress and the level of intracellular ROS in human mononuclear cells. Excessive elevation in ROS levels is an important cause of oxidative damage in lipids and proteins and nucleic acids. It therefore causes changes in enzyme activity and gene expression, eventually leading to various diseases, including sleep disorder, arthrosclerosis, loss of appetite, diabetes, dizziness, rheumatoid arthritis, cardiovascular disease, nausea and stroke ,,. In addition, degradation of the pro-oxidant-antioxidant balance due to an uncontrolled increase in ROS may also result in lipid peroxidation. Lipid peroxidation is the process in which cell membranes are rapidly destroyed due to the oxidation of components of phospholipids containing unsaturated fatty acids. By continuing this reaction, lipid peroxides (-C0, H) accumulate in the membrane, and transform polyunsaturated fatty acids into biologically active substances . Consequently, lipid peroxidation leads to significant damage in the cells, such as disturbances in membrane transport, structural changes, cell membrane fluidity, damage to protein receptors in membrane structures, and changes in the activity of cell membrane enzymes . Hoyto et al. demonstrated significant induction of lipid peroxidation after exposure to EMF in the mouse SH-SY5Y cell and L929 fibroblast cells . Epidemiological studies have also suggested that oxidative damage to lipids in blood vessel walls may be a significant contributor to the development of atherosclerosis ,,. Figure 1: Reactive oxygen species generated by the effects of exposure to EMF can damage various cellular structures in neurons of the central nervous system . Studies generally focus on the brain, since cell phones are held close to the head during use. There is considerable evidence that EMF can affect neural functions in the human brain . The relation between EMF and neurological disorders can be explained in terms of the heat shock response . The heat shock protein (HSP) response is generally concerned with heat shock, exposure to heavy metals and environmental insults such as EMF. Generally, HSP is a marker in cells under stress. Living organisms generate stress proteins in order to survive environmental stressors. The heat shock response is regarded as a general response to a wide variety of stresses, such as oxidative stress . In humans and other mammals, many environmental stimuli causes ultraviolet radiation , ionizing radiation  and laser radiation  are caused by cellular stresses and alter Hsp90 and 70 levels. Non-ionizing radiation also causes HSP changes in various tissues, including the brain , myocardium , testis  and skin . Studies have described these findings as an adaptation or readjustment of cellular stress proteins before preparing the cellular machinery for an adequate environmental change. Small, transitory readjustments of the circuits may thus decisively influence overall stress tolerance ,. Low frequency (0–300 Hz) and RF (10 MHz–300 GHz) EMF has also been reported to alter the permeability of the blood–brain barrier ,,. At the same time, these changes in the blood-brain barrier may lead to excess accumulation of heavy metals and specifically of iron in the brain. This effect may trigger several neuronal disorders ,. Some studies have reported that DNA damage and blood–brain barrier disruption is connected, and that autism spectrum conditions are associated with EMF exposure. The disruption of fertility and reproduction associated with EMF/RFR may also be related to the increasing incidence of autism spectrum conditions ,,,,. Oxidative stress plays an important role in DNA damage process, general and specific gene expression and cell apoptosis. The brain has a high metabolic rate, making it more prone to damage by ROS and oxidative damage compared to other organs . Excessive amounts of ROS in tissues may lead to necrosis, the death of neurons and neuronal damage in brain tissue, as well as to neurological disorders such as Alzheimer’s disease, spinal cord injury, multiple sclerosis, and epilepsy  [Figure 2]. Several studies have observed neuronal damage and cellular losses caused by exposure to EMF in many regions of the brain, including the cortex, basal ganglia, hippocampus and cerebellum ,,,,. One epidemiological study determined an association between amyotrophic lateral sclerosis and exposure to high intensity EMF, but no correlation was observed with other neurodegenerative diseases . Rubin et al. noted that the pain level of headache may increase during exposure but decreased immediately when exposure ceased . Haynal and Regli suggested that exposure to extremely low frequency (ELF)-EMF may be linked to amyotrophic lateral sclerosis, a fatal neurodegenerative disorder . Maskey et al. investigated the effects on the brain of 835-MHz over different exposure times and observed a significant loss of pyramidal cells in the CA1 region of the hippocampus . Another case control study by Villeneuve et al. reported a 5.3-fold increased risk of one brain cancer type, glioblastoma, in individuals exposed to EMF, but no increased risk for other brain cancers . 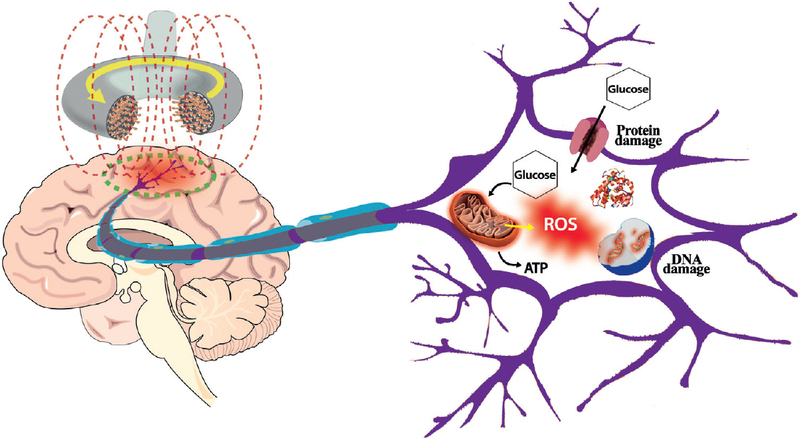 Figure 2: The role of EMF emitted from several devices, depicting an increase in the generation of ROS and consequent oxidative stress in the central nervous system resulting from the inability of the antioxidant defense system to cope with this increase in ROS . Some studies have shown that microwave exposure failed to induce a detectable genotoxic effect by itself, and have reported interference with DNA-repair mechanisms ,,,. Oxidative damage in DNA occurs as a result of interaction between free radicals and DNA, with the addition of bases or abstractions of hydrogen atoms from sugar moiety. Modified nucleotides emerge as products of damage (8-OH-dG) when DNA is modified by the oxidative damage caused by reactive oxygen molecules . These products are markers of oxidative stress measured using analytical methods ,. Agarwal and Saleh and Aitken et al. have reported that ROS may have harmful effects on sperm DNA and other biomolecules, proteins and lipids, consequently leading to male infertility ,. At the same time, men carrying phones in their pocket or on their belt and therefore, most of adverse effects of the EMF are seen in reproductive organs. Sepehrimanesh et al. showed that exposure to RF-EMF produces increases in testicular proteins in adults that are related to carcinogenic risk and reproductive damage . Neuroendocrine changes caused by EMFs are a key factor in changing hormone functions . Eroğlu et al. stated that exposure to cell phone radiation reduces the motility and changes the morphology of isolated sperm cells. They also discussed the effects of EMFs on female infertility . Goldhaber et al. reported a significant increase in fetal abnormalities and spontaneous abortions in pregnant women exposed to EMF . Many of these effects may occur due to hormonal changes ,. Studies on the effects of EMF on tissues discussed here are set out in [Table 1] and [Table 2]. Table 1: Some experimental studies on the oxidative effects of EMF. Table 2: Some clinical studies of the oxidative effects of EMF. Antioxidant defense systems have developed in organisms to control the formation of free radicals and to prevent the harmful effects of these molecules . These antioxidants reduce or impair the damage mechanism of ROS via their free radical scavenging activities . Two major mechanisms have been identified for antioxidants . The first is a mechanism of chain disruption in which the primary antioxidant releases an electron to the free radical found in the systems. The second mechanism includes elimination of the initiators of species of ROS/reactive nitrogen (secondary antioxidants) by suppressing chain-initiating catalysts. Antioxidants may also impact on biological systems by various mechanisms involving electron releasing, metal ion chelation, co-antioxidants, or by maintaining the expression of genes . If these antioxidant defense mechanisms are impaired through exposure to an agent that causes the overproduction of ROS, including EMF, antioxidants may not be sufficient or free radical formation may increase to such an extent that it overpowers the defense capabilities of antioxidants . This is known as oxidative stress. EMFs can initiate various biochemical and physiological changes, including oxidative stress, in the systems of various species. Several studies in the literature show that plasma membrane receptors are possible targets for field interactions ,. Generally, antioxidants have been divided into exogenous groups (carotene, C, and vitamin E), and endogenous groups (melatonin (MEL)), SOD, GSH-Px, CAT, including; protein (MEL), vitamins (vitamin C), trace elements (Mg, Se), complexes of compound, hydrophilic (ascorbic acid, urate, flavonoids) and hydrophobic (β-carotene, α-tocopherol) substances, with direct impacts (SOD, CAT), and indirect effects (vitamin E). Substances with functions concerning the membrane (vitamin A and E, β- carotene), circulation (vitamin C, amino acids and polyphenols), cytosol (co-enzyme Q10) are classified as antioxidants ,. Glutathione (GSH) is an endogenous antioxidant and an important cellular defense agent against oxidative damage. GSH reacts with the free radicals in the cell and reduces the entry of hydrogen peroxides . GSH also prevents the oxidization of sulfhydryl groups in the protein structure. GSH levels in tissues are often used as a marker for measuring radical damage. It acts as a substrate for antioxidant enzymes that causes resistance to radical-induced damage, behaving like a radical scavenger. GSH is especially important for the activity of glutathione peroxidase (GSH-Px), glutathione reductase (GR) and glutathione-S-transferase (GST). In the oxidative stress process, levels of GSH decrease, while glutathione disulfide increases. In this case, accumulation of hydrogen peroxide (H2O2) is scavenged by the effects of reductase and glutathione peroxidase (GSH-Px). GSH-Px is also an important enzyme, which prevents damage to phagocytic cells caused by free radicals. A decrease in GSH-Px activity leads to the accumulation of hydrogen peroxide and to cell damage. GSH-Px also prevents the initiation of lipid peroxidation . EMF emitted by cellular phones is known to be related to a decreased level of GSH in brain tissue and blood . However, a decreased level of blood GSH may possibly be explained by an elevated oxidation rate and use of GSH during the elimination of lipid and other peroxides . Awad and Hassan investigated the brains of rats exposed to 900-MHz EMF from mobile phones for 1 h/day for one week. They observed an increase in lipid peroxidation after exposure to mobile phones . Aydın and Akar studied the effect of 900-MHz EMF for 2 h/day for 45 days on lymphoid organs in immature and mature rats. They reported that CAT and GPx activities decreased significantly compared to a control group. Similarly, an increase in lipid peroxidation and a concomitant demolition in GSH levels were seen in all lymphoid organs after EMF exposure, suggesting that increased levels of lipid peroxidation may have been a consequence of depleted GSH stores . Luo et al. investigated that the whether the protective effects of LSPCs performed by oral gavage on oxidative stress injury induced by ELF-EMF exposure. According the results, GST activity was significantly decreased in the ELF-EMF group when compared with the control group. They found that LSPCs could effectively prohibit oxidative stress damage induced by ELF-EMF exposure, it may be related to the ability to remove free radicals and induce antioxidant enzyme activity . Singh et al. investigated the biochemical mechanism of the interaction of 900-MHz mobile phone EMF with root formation in mung bean hypocotyls. The obtained results showed up regulation of the activities of antioxidant enzymes such as CAT and GR, which protect against oxidative damage induced by EMF . Sepehrimanesh et al. studied that effect of 900-MHz electromagnetic field (EMF) exposure on rat serum and testes antioxidant enzyme levels. They observed that after 30 days exposure both SOD and GPx activities decreased in the long-time EMF exposure group . In the other study RF-EMF exposure caused increase antioxidant stress response via increase of CAT and GR activity it lead to the generation of lipid and protein oxidative damage . CAT is a common enzyme present in organisms exposed to oxygen, such as vegetables, fruits and animals. It catalyzes the reaction that degrades hydrogen peroxide to water and oxygen. It is a crucial enzyme in the protection of the cell against oxidative damage caused by ROS. CAT exerts its peroxidase activity in vivo. It can also catalyze the reaction of oxidation, by hydrogen peroxide, of numerous metabolites and toxins, not excluding formaldehyde, formic acid, phenols, acetaldehyde and alcohols. Its basic function is to remove hydrogen peroxide and peroxide ROOH in molecular oxygen in order to prevent irreversible damage to the membranes . EMF is known to impact on biological systems by increasing ROS, which causes oxidative stress by altering the CAT levels of tissues ,,. Odaci et al. observed a decrease in CAT levels in an EMF-exposed group. Exposure to EMF during the prenatal period also caused oxidative stress in developing rat embryos. This oxidative stress persisted through postnatal day 21 . Vuokko et al. reported that EMF exposure led to depression of antioxidant systems because of raised lipid peroxidation and generation of free radicals . Mobile phones triggered oxidative damage in the living cell by increasing the levels of xanthine oxidase and carbonyl group activity and reducing CAT activity. Treatment with MEL significantly prevents oxidative damage in the brain . Özgüner et al. reported that EMF exposure leads to renal tissue damage by raising nitric oxide and malondialdehyde (MDA) levels . SOD is an enzyme that catalyzes the reaction in which the toxic superoxide (O2−) radical is partitioned into molecular oxygen (O2) or hydrogen peroxide (H2O2). Superoxide is generated as a by-product as a result of the oxygen metabolism, leading to several types of damage to cells. Three forms of SOD can be encountered in humans; SOD1 is present in the cytoplasm, SOD2 in the mitochondria, and SOD3 in the extracellular compartment. SOD is present in the cytosol and mitochondria and inactivates the existing superoxide radicals, as well as protecting cells from the harmful effects of the superoxide radicals . Research has shown that the rat brain is susceptible to the effects of exposure to ELF-EMF. Decreased CAT and SOD activity results in after exposure suggested that EMF might change the antioxidant levels of the brain . Gambari et al. reported that 50-day exposure to EMF causes oxidative stress by increasing MDA levels and reducing SOD activity, and observed that treatment with vitamin E prevented oxidative stress and lipid peroxidation in the substantia nigra . Another study reported decreased antioxidant enzyme levels and increased levels of ROS in the kidneys of rats exposed to 900-MHz EMF for 30 min/day for 1 month . When applied antioxidant supplemented with EMF exposure, improved the hydrophilic, lipophilic and enzymatic antioxidant blood capacity and partially compensated for these changes ,. Vitamin E (tocopherol) is one of the most important such antioxidants. Compounds of vitamin E, including alpha, beta, gamma and delta tocopherols, are soluble in lipid. Vitamin E is stored in the liver and has many functions. Its main antioxidant function is to prevent lipid peroxidation . Several studies have shown the beneficial effects of vitamin E observed by reducing alteration in antioxidant capacity against the harmful effects of EMF ,. Ghambari et al. observed that exposure to 3-MT EMF led to oxidative stress by reducing SOD activity and reported that treatment with vitamin E prevents the lipid peroxidation in the substantia nigra . Mohammadnejad et al. studied ultrastructural changes in the thymus after exposure to EMF and investigated the protective effects of vitamin E in preventing these change. Their results demonstrated that exposure to EMF caused damage to the immune system and that vitamin E consumption can prevent ultrastructural alteration in tissue . Vitamin B9 (folic acid and folate) is crucial for several functions in the human body, ranging from the production of nucleotides to homocysteine remethylation. In humans, folate is required for the body to make or repair DNA, and to methylate DNA, in addition to its function as a cofactor in various biological reactions. Moreover, this vitamin possesses antioxidant features . It is especifically crucial during periods involving quick cell division and cellular growth. Folic acid (FA) is particularly required in pregnancy and for infant brain development. It is also necessary for the formation of new cells . Our previous study revealed that FA prevented the adverse effect of exposure to EMF by preventing reductions in cell numbers in the cerebellum and brain. Kıvrak observed that EMF triggered oxidative damage by increasing the levels of CAT activity and reducing GPx activity. They also noticed that oxidative damage in the brain was significantly prevented by FA therapy  [Figure 3]. Figure 3: Images of cerebellar tissues from the control (Cont), EMF exposure, FA and EMF + FA (EFA) groups. The letter P indicates healthy Purkinje cells in the Cont and FA groups. Necrosis of Purkinje cells is indicated with a star in the EMF group . MEL is a hormone secreted by the pineal gland and that is also known as N-acetyl-5-methoxy tryptamin. It functions as a first line of defense against oxidative stress . This hormone acts together with other antioxidants such as CAT, SOD and GPx to increase the effectiveness of each antioxidant. As a free radical scavenger, it possesses amphiphilic properties and can easily cross cell membranes and the blood-brain barrier ,,. Previous studies have shown that MEL exhibits a protective effect against EMF-induced oxidative stress ,,. Koc et al. showed that MEL reduced neuronal damage in the hippocampus induced by 900-MHz EMF. Ozguner et al. showed that exposure to 900-MHz EMF led to mild skin alterations . Ulubay et al. stated that exposure to 900-MHz EMF in the rat kidney during the prenatal period results not only in an increase in total kidney volume, but also in decreased numbers of glomeruli. The application of MEL was found to prevent the negative effects of EMF on the kidneys . Lai and Singh demonstrated that MEL prevents EMF-induced DNA damage resulting from free radical generation in rat brain cells . The biological effect of exposure to EMF is a subject of particular research interest. The results of the recent studies not only clearly demonstrate that EMF exposure triggers oxidative stress in various tissues, but also that it causes significant changes in levels of blood antioxidant markers. Fatigue, headache, decreased learning ability, and cognitive impairment are among the symptoms caused by EMF. The human body should therefore be protected against exposure to EMF because of the risks this can entail. As reported in many studies, people may use various antioxidants such as vitamin E, MEL and FA to prevent the potential adverse effects of exposure to EMF. Megha K, Deshmukh PS, Banerjee BD, Tripathi AK, Abegaonkar MP. Microwave radiation induced oxidative stress, cognitive impairment and inflammation in brain of Fischer rats. Indian J Exp Biol 2012;50:889-96. Challis LJ. Mechanisms for interaction between RF fields and biological tissue. Bioelectromagnetics 2005;(Suppl 7):S98-106. Leszczynski D, Joenvaara S, Reivinen J, Kuokka R. Non-thermal activation of the hsp27/p38MAPK stress pathway by mobile phone radiation in human endothelial cells: molecular mechanism for cancer- and blood-brain barrier-related effects. Differentiation 2002;70:120-9. Sepehrimanesh M, Kazemipour N, Saeb M, Nazifi S. Analysis of rat testicular proteome following 30-day exposure to 900 MHz electromagnetic field radiation. Electrophoresis 2014;35:3331-8. Sepehrimanesh M, Kazemipour N, Saeb M, Nazifi S, Davis DL. Proteomic analysis of continuous 900-MHz radiofrequency electromagnetic field exposure in testicular tissue: a rat model of human cell phone exposure. Environ Sci Pollut Res Int 2017;24:13666-73. Tkalec M, Malaric K, Pevalek-Kozlina B. Exposure to radiofrequency radiation induces oxidative stress in duckweed Lemna minor L. Sci Total Environ 2007;388:78-89. 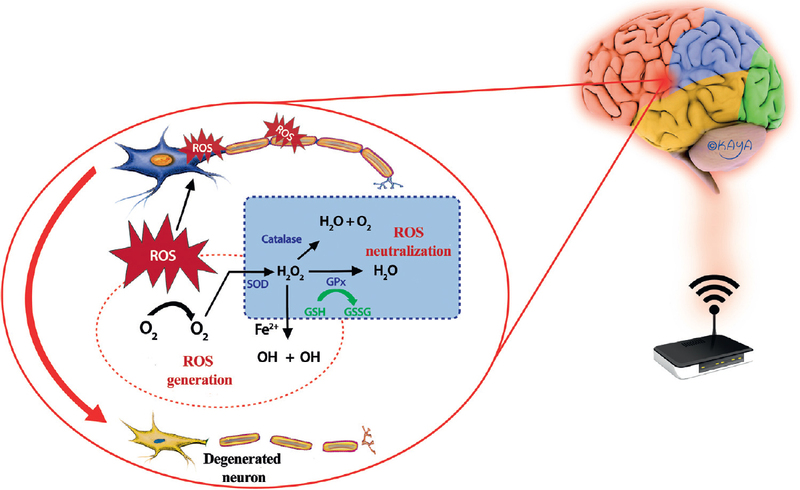 Cui K, Luo X, Xu K. Ven Murthy MR. Role of oxidative stress in neurodegeneration: recent developments in assay methods for oxidative stress and nutraceutical antioxidants. Prog Neuropsychopharmacol Biol Psychiatry 2004;28:771-99. Calcabrini C, Mancini U, De Bellis R, Diaz AR, Martinelli M, Cucchiarini L, et al. Effect of extremely low-frequency electromagnetic fields on antioxidant activity in the human keratinocyte cell line NCTC 2544. Biotechnol Appl Biochem 2016. Venugopal SK, Devaraj S, Yang T, Jialal I. alpha-tocopherol decreases superoxide anion release in human monocytes under hyperglycemic conditions via inhibition of protein kinase C-alpha. Diabetes 2002;51:3049-54. Halliwell B. Oxidative stress and cancer: have we moved forward. Biochem J 2007;401:1-11. Ames BN, Shigenaga MK, Hagen TM. Oxidants, antioxidants, and the degenerative diseases of aging. P Natl Acad Sci USA 1993;90:7915-22. Basaga HS. Biochemical aspects of free-Radicals. Biochem Cell Biol 1990;68:989-98. Stadtman ER, Oliver CN. Metal-catalyzed oxidation of proteins. J Biol Chem 1991;256:2005. Feychting M, Ahlbom A. Magnetic fields and cancer in children residing near Swedish high-voltage power lines. Am J Epidemiol 1993;138:467-81. Ozguner F, Altinbas A, Ozaydin M, Dogan A, Vural H, Kisioglu AN, et al. Mobile phone-induced myocardial oxidative stress: protection by a novel antioxidant agent caffeic acid phenethyl ester. Toxicol Ind Health 2005;21:223-30. Valberg PA, van Deventer TE, Repacholi MH. Workgroup report: base stations and wireless networks-radiofrequency (RF) exposures and health consequences. Environ Health Perspect 2007;115:416-24. Nishiyama HIM, Kato N. Relay-by-smartphone: realizing multihop device-to-device communications. IEEE Com Mag 2014;52:56-65. Manikonda PK, Rajendra P, Devendranath D, Gunasekaran B, Channakeshava Aradhya RSS, et al. Influence of extremely low frequency magnetic fields on Ca2+ signaling and NMDA receptor functions in rat hippocampus. Neurosci Lett 2007;413:145-9. Soderqvist F, Carlberg M, Hardell L. Use of wireless telephones and serum S100 B levels: a descriptive cross-sectional study among healthy Swedish adults aged 18-65 years. Sci Total Environ 2009;407:798-805. Behari J. Biological responses of mobile phone frequency exposure. Indian J Exp Biol 2010;48:959-81. Gherardini L, Ciuti G, Tognarelli S, Cinti C. Searching for the perfect wave: the effect of radiofrequency electromagnetic fields on cells. Int J Mol Sci 2014;15:5366-87. Alberts B, Johnson A, Lewis J, Raff M, Roberts K, Walter P. Membrane Transport of Small Molecules and the Electrical Properties of Membranes. Molecular Biology of the Cell. 4th edition New York: Garland Science; 2002, pp. 651. Challis LJ. Mechanisms for interaction between RF fields and biological tissue. Bioelectromagnetics 2005:S98-106. Georgiou CD. Oxidative stress induced biological damage by low level EMFs: mechanism of free radical pair electron spinpolarization and biochemical amplification. Eur J Oncol 2010;5:66-113. Chen G, Upham BL, Sun W, Chang CC, Rothwell EJ, Chen KM, et al. Effect of electromagnetic field exposure on chemically induced differentiation of friend erythroleukemia cells. Environ Health Perspect 2000;108:967-72. 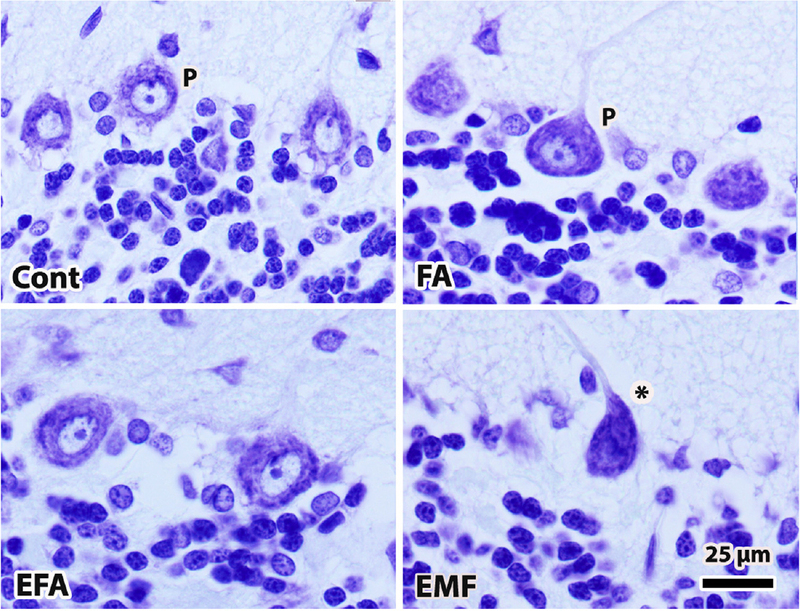 Park JE, Seo YK, Yoon HH, Kim CW, Park JK, Jeon S. Electromagnetic fields induce neural differentiation of human bone marrow derived mesenchymal stem cells via ROS mediated EGFR activation. Neurochem Int 2013;62:418-24. Jajte J, Zmyslony M. [The role of melatonin in the molecular mechanism of weak, static and extremely low frequency (50 Hz) magnetic fields (ELF)]. Med Pr 2000;51:51-7. Lai H, Singh NP. Magnetic-field-induced DNA strand breaks in brain cells of the rat. Environ Health Perspect 2004;112:687-94. Aydin B, Akar A. Effects of a 900-MHz electromagnetic field on oxidative stress parameters in rat lymphoid organs, polymorphonuclear leukocytes and plasma. Arch Med Res 2011;42:261-7. Dasdag S, Akdag MZ. The link between radiofrequencies emitted from wireless technologies and oxidative stress. J Chem Neuroanat 2016;75:85-93. Zmyslony M, Politanski P Rajkowska E, Szymczak W, Jajte J. Acute exposure to 930 MHz CW electromagnetic radiation in vitro affects reactive oxygen species level in rat lymphocytes treated by iron ions. Bioelectromagnetics 2004;25:324-8. Wu W, Yao K, Wang KJ, Lu DQ, He JL, Xu LH, et al. Blocking 1800 MHz mobile phone radiation-induced reactive oxygen species production and DNA damage in lens epithelial cells by noise magnetic fields. Zhejiang Da Xue Bao Yi Xue Ban 2008;37:34-8. Yao K, Wu W, Wang K, Ni S, Ye P, Yu Y, et al. Electromagnetic noise inhibits radiofrequency radiation-induced DNA damage and reactive oxygen species increase in human lens epithelial cells. Mol Vis 2008;14:964-9. Yao K, Wu W, Yu Y, Zeng Q, He J, Lu D, et al. Effect of superposed electromagnetic noise on DNA damage of lens epithelial cells induced by microwave radiation. Invest Ophthalmol Vis Sci 2008;49:2009-15. Oktem F, Ozguner F, Mollaoglu H, Koyu A, Uz E. Oxidative damage in the kidney induce by 900-MHz-emitted mobile phone: protection by melatonin. Arch Med Res 2005;36:350-5. Fang YZ, Yang S, Wu G. Free radicals, antioxidants, and nutrition. Nutrition 2002;18:872-9. Fridovich I. Fundamental aspects of reactive oxygen species, or what’s the matterwith oxygen. Ann N Y Acad Sci 1999;893:13-8. Mattson MP. Metal-catalyzed disruption of membrane protein and lipid signaling in the pathogenesis of neurodegenerative disorders. Ann N Y Acad Sci 2004;1012:37-50. Halliwell B. Free radicals and antioxidants: a personal view. Nutr Rev 1994;52:253-65. Zmyslony M, Jajte JM. The role of free radicals in mechanisms of biological function exposed to weak, constant and net magnetic fields. Med Pr 1998;49:177-86. Hoyto A, Luukkonen J, Juutilainen J, Naarala J. Proliferation, oxidative stress and cell death in cells exposed to 872 MHz radiofrequency radiation and oxidants. Radiat Res 2008;170:235-43. Collins T. Endothelial nuclear factor-kappa B and the initiation of the atherosclerotic lesion. Lab Invest 1993;68:499-508. Lusis AJ, Navab M. Lipoprotein oxidation and gene expression in the artery wall: new opportunities for pharmacologic intervention in atherosclerosis. Biochem Pharmacol 1993;46:2119-26. Steinberg D, Parthasarathy S, Carew TE, Khoo JC, Witztum JL. Beyond cholesterol: modifications of low-density lipoprotein that increase its atherogenicity. N Engl J Med 1989;320:915-24. Oh J, Lee YD, Wagers AJ. Stem cell aging: mechanisms, regulators and therapeutic opportunities. Nat Med 2014:870-80. Croft RJ, Chandler JS, Burgess AP, Barry RJ, Williams JD, Clarke AR. Acute mobile phone operation affects neural function in humans. Clin Neurophysiol 2002;113:1623-32. Kempson IM, Martin AL, Denman JA, French PW, Prestidge CA, Barnes TJ. Detecting the presence of denatured human serum albumin in an adsorbed protein monolayer using TOF-SIMS. Langmuir 2010;26:12075-80. Wu C. Heat shock transcription factors: structure and regulation. Annu Rev Cell Dev Biol 1995;11:441-69. Trautinger F, Kindas-Mugge I, Knobler RM, Honigsmann H. Stress proteins in the cellular response to ultraviolet radiation. J Photochem Photobiol B 1996;35:141-8. Calini V, Urani C, Camatini M. Overexpression of HSP70 is induced by ionizing radiation in C3H 10T1/2 cells and protects from DNA damage. Toxicol In Vitro 2003;17:561-6. Novoselova EG, Cherenkov DA, Glushkova OV, Novoselova TV, Chudnovskii VM, Iusupov VI, et al. Effect of low-intensity laser radiation (632.8 nm) on immune cells isolated from mice. Biofizika 2006;51:509-18. Jorge-Mora MT, Folgueiras MA, Leiro-Vidal JM, Jorge-Barreiro FJ, Ares-Pena FJ, Lopez-Martin E. Exposure to 2. 45 GHz microwave radiation provokes cerebral changes in induction of HSP90 heat shock protein in rat. Prog Electromagn Res 2010;100:351-79. George I, Geddis MS, Lill Z, Lin H, Gomez T, Blank M, et al. Myocardial function improved by electromagnetic field induction of stress protein hsp 70. J Cell Physiol 2008;216:816-23. Shi B, Farboud B, Nuccitelli R, Isseroff RR. Power-line frequency electromagnetic fields do not induce changes in phosphorylation, localization or expression of the 27-kiloDalton heat shock protein in human keratinocytes. Environ Health Perspect 2003;111:281-8. Ramaglia V, Buck LT. Time-dependent expression of heat shock proteins 70 and 90 in tissues of the anoxic western painted turtle. J Exp Biol 2004;207:3775-84. Yang J. Frequency shifts in a piezoelectric body due to small amounts of additional mass on its surface. IEEE Trans Ultrason Ferroelectr Freq Control 2004;51:1199-202. Grigor’ev IuG. The electromagnetic fields of cellular phones and the health of children and of teenagers (the situation requiring to take an urgent measure). Radiats Biol Radioecol 2005;45:442-50. Oscar KJ, Hawkins TD. Microwave alteration of the blood-brain barrier system of rats. Brain Res 1977;126:281-93. Nittby H, Grafstrom G, Eberhardt JL, Malmgren L, Brun A, Persson BR, et al. Radiofrequency and extremely low-frequency electromagnetic field effects on the blood-brain barrier. Electromagn Biol Med 2008;27:103-26. Castelnau PA, Garrett RS, Palinski W, Witztum JL, Campbell IL, Powell HC. Abnormal iron deposition associated with lipid peroxidation in transgenic mice expressing interleukin-6 in the brain. J Neuropathol Exp Neurol 1998;57:268-82. Thompson KJ, Shoham S, Connor JR. Iron and neurodegenerative disorders. Brain Res Bull 2001;55:155-64. Herbert MR, Sage C. Autism and EMF? Plausibility of a pathophysiological link–-Part I. Pathophysiology 2013;20:191-209. Thomas RH, Meeking MM, Mepham JR, Tichenoff L, Possmayer F, Liu S, et al. The enteric bacterial metabolite propionic acid alters brain and plasma phospholipid molecular species: further development of a rodent model of autism spectrum disorders. J Neuroinflammation 2012;9:153. Onore CE, Nordahl CW, Young GS, Van de Water JA, Rogers SJ, Ashwood P. Levels of soluble platelet endothelial cell adhesion molecule-1 and P-selectin are decreased in children with autism spectrum disorder. Biol Psychiatry 2012;72:1020-5. Ozmen I, Naziroglu M, Alici HA, Sahin F, Cengiz M, Eren I. Spinal morphine administration reduces the fatty acid contents in spinal cord and brain by increasing oxidative stress. Neurochem Res 2007;32:19-25. Deshmukh PS, Megha K, Banerjee BD, Ahmed RS, Chandna S, Abegaonkar MP, et al. Detection of low level microwave radiation induced deoxyribonucleic acid damage vis-a-vis genotoxicity in brain of fischer rats. Toxicol Int 2013;20:19-24. Erdem Koc, Kaplan S, Altun G, Gumus H, Gulsum Deniz O, Aydin I, et al. Neuroprotective effects of melatonin and omega-3 on hippocampal cells prenatally exposed to 900 MHz electromagnetic fields. Int J Radiat Biol 2016;92:590-5. Tasset I, Medina FJ, Jimena I, Aguera E, Gascon F, Feijoo M, et al. Neuroprotective effects of extremely low-frequency electromagnetic fields on a Huntington’s disease rat model: effects on neurotrophic factors and neuronal density. Neuroscience 2012;209:54-63. Kivrak EG. Investigation of the effects of boswellia sacra and folic acid on hippocampus with electromagnetic fields Master thesis. Samsun, Turkey: Ondokuz Mayis University; 2014. Johansen C. Electromagnetic fields and health effects-epidemiologic studies of cancer, diseases of the central nervous system and arrhythmia-related heart disease. Scand J Work Environ Health 2004;30(Suppl 1):1-30. Rubin GJ, Hahn G, Everitt BS, Cleare AJ, Wessely S. Are some people sensitive to mobile phone signals: within participants double blind randomised provocation study. BMJ 2006;332:886-91. Haynal A, Regli F. Amyotrophic lateral sclerosis associated with accumulated electric injury. Confin Neurol 1964;24:189-98. Maskey D, Kim M, Aryal B, Pradhan J, Choi IY, Park KS, et al. Effect of 835 MHz radiofrequency radiation exposure on calcium binding proteins in the hippocampus of the mouse brain. Brain Res 2010;1313:232-41. Villeneuve PJ, Agnew DA, Johnson KC, Mao Y. Canadian Cancer Registries Epidemiology Research G. Brain cancer and occupational exposure to magnetic fields among men: results from a Canadian population-based case-control study. Int J Epidemiol 2002;31:210-7. Othman SB, Yabe T. Use of hydrogen peroxide and peroxyl radicals to induce oxidative stress in neuronal cells. Reviews in Agricultural Science 2015;3:40-5. Kesari KK, Kumar S, Behari J. 900-MHz microwave radiation promotes oxidation in rat brain. Electromagn Biol Med 2011;30:219-34. Atli Sekeroglu Z, Akar A, Sekeroglu V. Evaluation of the cytogenotoxic damage in immature and mature rats exposed to 900 MHz radiofrequency electromagnetic fields. Int J Radiat Biol 2013;89:985-92. Liu C, Gao P, Xu SC, Wang Y, Chen CH, He MD, et al. Mobile phone radiation induces mode-dependent DNA damage in a mouse spermatocyte-derived cell line: a protective role of melatonin. Int J Radiat Biol 2013;89:993-1001. Ruediger HW. 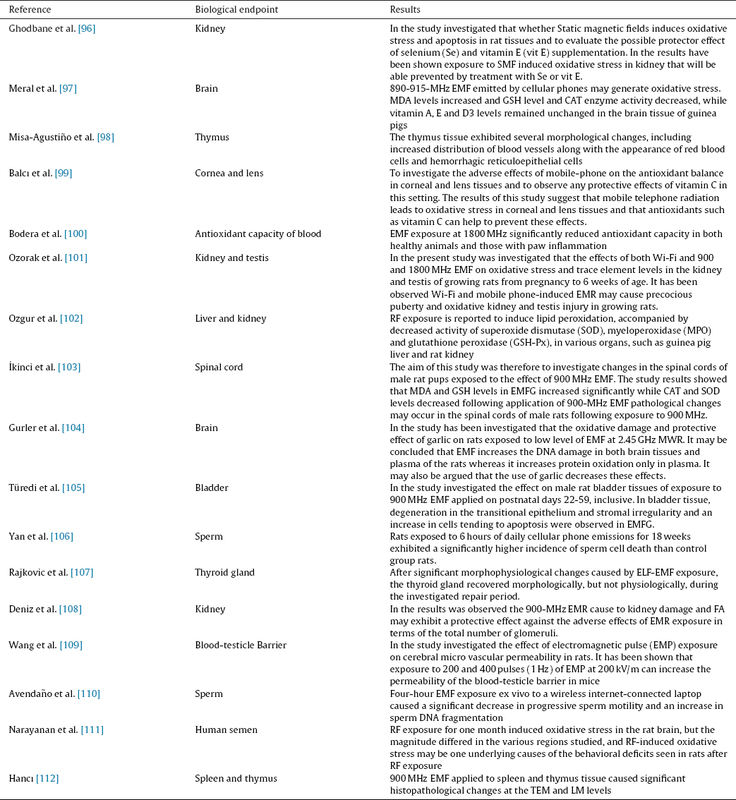 Genotoxic effects of radiofrequency electromagnetic fields. Pathophysiology 2009;16:89-102. Kryston TB, Georgiev AB, Pissis P, Georgakilas AG. Role of oxidative stress and DNA damage in human carcinogenesis. Mutat Res 2011;711:193-201. Henderson PT, Evans MD, Cooke MS. Salvage of oxidized guanine derivatives in the (2’-deoxy) ribonucleotide pool as source of mutations in DNA. Mutat Res 2010;703:11-7. Tothova L, Kamodyova N, Cervenka T, Celec P. Salivary markers of oxidative stress in oral diseases. Front Cell Infect Microbiol 2015;5:73. Aitken RJ, Harkiss D, Buckingham DW. Analysis of lipid peroxidation mechanisms in human spermatozoa. Mol Reprod Dev 1993;35:302-15. Agarwal A, Saleh RA. Role of oxidants in male infertility: rationale, significance, and treatment. Urol Clin North Am 2002;29:817-27. Nelson JF, Karelus K, Bergman MD, Felicio LS. Neuroendocrine involvement in aging: evidence from studies of reproductive aging and caloric restriction. Neurobiol Aging 1995;16:837-43, discussion 55-6. Goldhaber MK, Polen MR, Hiatt RA. The risk of miscarriage and birth defects among women who use visual display terminals during pregnancy. Am J Ind Med 1988;13:695-706. Forgacs Z, Somosy Z, Kubinyi G, Bakos J, Hudak A, Surjan A, et al. Effect of whole-body 1800 MHz GSM-like microwave exposure on testicular steroidogenesis and histology in mice. Reprod Toxicol 2006;22:111-7. Ghodbane SLA, Ammari M, Sakly M, Abdelmelek H. Does static magnetic field-exposure induced oxidative stress and apoptosis in rat kidney and muscle? Effect of vitamin E and selenium supplementations. Gen Physiol Biophys 2015;34:23-32. Meral I, Mert H, Mert N, Deger Y, Yoruk I, Yetkin A, et al. Effects of 900-MHz electromagnetic field emitted from cellular phone on brain oxidative stress and some vitamin levels of guinea pigs. Brain Res 2007;1169:120-4. Misa-Agustino MJ, Leiro-Vidal JM, Gomez-Amoza JL, Jorge-Mora MT, Jorge-Barreiro FJ, Salas-Sanchez AA, et al. EMF radiation at 2450 MHz triggers changes in the morphology and expression of heat shock proteins and glucocorticoid receptors in rat thymus. Life Sci 2015;127:1-11. Balci M, Devrim E, Durak I. Effects of mobile phones on oxidant/antioxidant balance in cornea and lens of rats. Curr Eye Res 2007;32:21-5. Bodera P, Stankiewicz W, Zawada K, Antkowiak B, Paluch M, Kieliszek J, et al. Changes in antioxidant capacity of blood due to mutual action of electromagnetic field (1800 MHz) and opioid drug (tramadol) in animal model of persistent inflammatory state. Pharmacol Rep 2013;65:421-8. Ozorak A, Naziroglu M, Celik O, Yuksel M, Ozcelik D, Ozkaya MO, et al. Wi-Fi (2.45 GHz)- and mobile phone (900 and 1800 MHz)-Induced risks on oxidative stress and elements in kidney and testis of rats during pregnancy and the development of offspring. biol trace elem. Res 2013;156:221-9. Ozgur E, Guler G, Seyhan N. Mobile phone radiation-induced free radical damage in the liver is inhibited by the antioxidants N-acetyl cysteine and epigallocatechin-gallate. Int J Radiat Biol 2010;86:935-45. Ikinci A, Mercantepe T, Unal D, Erol HS, Sahin A, Aslan A, et al. Morphological and antioxidant impairments in the spinal cord of male offspring rats following exposure to a continuous 900 MHz electromagnetic field during early and mid-adolescence. J Chem Neuroanat 2016;75:99-104. Gurler HS, Bilgici B, Akar AK, Tomak L, Bedir A. Increased DNA oxidation (8-OHdG) and protein oxidation (AOPP) by low level electromagnetic field (2.45 GHz) in rat brain and protective effect of garlic. Int J Radiat. Biol 2014;90:892-6. Turedi S, Kerimoglu G, Mercantepe T, Odaci E. Biochemical and pathological changes in the male rat kidney and bladder following exposure to continuous 900-MHz electromagnetic field on postnatal days 22-59. Int J Radiat Biol 2017:1-10. Yan JG, Agresti M, Bruce T, Yan YH, Granlund A, Matloub HS. Effects of cellular phone emissions on sperm motility in rats. Fertil Steril 2007;88:957-64. Rajkovic V, Matavulj M, Gledic D, Lazetic B. Evaluation of rat thyroid gland morphophysiological status after three months exposure to 50 Hz electromagnetic field. Tissue Cell 2003;35:223-31. Deniz OG, Kivrak EG, Kaplan AA, Altunkaynak BZ. Effects of folic acid on rat kidney exposed to 900 MHz electromagnetic radiation. JMAU 2017:900 (in press). Wang XW, Ding GR, Shi CH, Zhao T, Zhang J, Zeng LH, et al. Effect of electromagnetic pulse exposure on permeability of blood-testicle barrier in mice. Biomed Environ Sci 2008;21:218-21. Avendano C, Mata A, Sarmiento CAS, Doncel GF. Use of laptop computers connected to internet through Wi-Fi decreases human sperm motility and increases sperm DNA fragmentation. Fertil Steril 2012;97:39-U93. Narayanan SN, Kumar RS, Kedage V, Nalini K, Nayak S, Bhat PG. Evaluation ol oxidant stress and antioxidant defense in discrete brain regions of rats exposed to 900 MHz radiation. Bratisl Med J 2014;115:260-6. Hanci H, Türedi S, Topal Z, Mercantepe T, Bozkurt I, Kaya H, et al. Can prenatal exposure to a 900 MHz electromagnetic field affect the morphology of the spleen and thymus, and alter biomarkers of oxidative damage in 21-day-old male rats? Biotech Histochem 2015;90:535-43. Lantow M, Lupke M, Frahm J, Mattsson MO, Kuster N, Simko M. ROS release and Hsp70 expression after exposure to 1,800 MHz radiofrequency electromagnetic fields in primary human monocytes and lymphocytes. Radiat Environ Biophys 2006;45:55-62. Baohong W, Lifen J, Lanjuan L, Jianlin L, Deqiang L, Wei Z, et al. Evaluating the combinative effects on human lymphocyte DNA damage induced by ultraviolet ray C plus 1.8 GHz microwaves using comet assay in vitro. Toxicology 2007;232:311-6. Ansarihadipour H, Bayatiani M. Influence of electromagnetic fields on lead toxicity: a study of conformational changes in human blood proteins. Iran Red Crescent Med J 2016;18:e28050. Belyaev IY, Hillert L, Protopopova M, Tamm C, Malmgren LO, Persson BR, et al. 915 MHz microwaves and 50 Hz magnetic field affect chromatin conformation and 53BP1 foci in human lymphocytes from hypersensitive and healthy persons. Bioelectromagnetics 2005;26:173-84. Lewicka M, Henrykowska GA, Pacholski K, Smigielski J, Rutkowski M, Dziedziczak-Buczynska M, et al. The effect of electromagnetic radiation emitted by display screens on cell oxygen metabolism – in vitro studies. Arch Med Sci 2015;11:1330-9. Lu YS, Huang BT, Huang YX. Reactive oxygen species formation and apoptosis in human peripheral blood mononuclear cell induced by 900 MHz mobile phone radiation. Oxid Med Cell Longev 2012;2012:740280. Sefidbakht Y, Moosavi-Movahedi AA, Hosseinkhani S, Khodagholi F, Torkzadeh-Mahani M, Foolad F, et al. Effects of 940 MHz EMF on bioluminescence and oxidative response of stable luciferase producing HEK cells. Photochem Photobiol Sci 2014;13:1082-92. Goraca A, Ciejka E, Piechota A. Effects of extremely low frequency magnetic field on the parameters of oxidative stress in heart. J Physiol Pharmacol 2010;61:333-8. Halliwell B. How to characterize an antioxidant- an update. Biochem Soc Symp 1995;61:73-101. Rice-Evans CA, Diplock AT. Current status of antioxidant therapy. Free Radic Biol Med 1993;15:77-96. Krinsky NI. Mechanism of action of biological antioxidants. Proc Soc Exp Biol Med 1992;200:248-54. Di Loreto S, Falone S, Caracciolo V, Sebastiani P, D’Alessandro A, Mirabilio A, et al. Fifty hertz extremely low-frequency magnetic field exposure elicits redox and trophic response in rat-cortical neurons. J Cell Physiol 2009;219:334-43. Sun W, Gan Y, Fu Y, Lu D, Chiang H. An incoherent magnetic field inhibited EGF receptor clustering and phosphorylation induced by a 50-Hz magnetic field in cultured FL cells. Cell Physiol Biochem 2008;22:507-14. E.N. Antioxidant defenses in eukaryotic cells. Basel, Switzerland: Birkhauser Verlag; 1993. Zhao X, Alexander JS, Zhang S, Zhu Y, Sieber NJ, Aw TY, et al. Redox regulation of endothelial barrier integrity. Am J Physiol Lung Cell Mol Physiol 2001;281:L879-86. Aslan L, Meral I. Effect of oral vitamin E supplementation on oxidative stress in guinea-pigs with short-term hypothermia. Cell Biochem Funct 2007;25:711-5. Awad SM, Hassan NS. Health Risks of electromagnetic radiation from mobile phone on brain of rats. Journal of Applied Sciences Research 2008;4:1994-2000. Luo X, Chen M, Duan Y, Duan W, Zhang H, He Y, et al. Chemoprotective action of lotus seedpod procyanidins on oxidative stress in mice induced by extremely low-frequency electromagnetic field exposure. Biomed Pharmacother 2016;82:640-8. Singh HP, Sharma VP, Batish DR, Kohli RK. Cell phone electromagnetic field radiations affect rhizogenesis through impairment of biochemical processes. Environ Monit Assess 2012;184:1813-21. Sepehrimanesh M, Nazifi S, Saeb M, Kazemipour N. Effect of 900 MHz radiofrequency electromagnetic field exposure on serum and testicular tissue antioxidantenzymes of rat. Online Journal of Veterinary Research 2016;20(9):617-24. Tkalec M, Stambuk A, Srut M, Malaric K, Klobucar GI. Oxidative and genotoxic effects of 900 MHz electromagnetic fields in the earthworm Eisenia fetida. Ecotoxicol Environ Saf 2013;90:7-12. Lanir A, Schejter A. On the sixth coordination position of beef liver catalase. Febs Lett 1975;55:254-6. Ozturk A, Baltaci AK, Mogulkoc R, Oztekin E. Zinc prevention of electromagnetically induced damage to rat testicle and kidney tissues. Biol Trace Elem Res 2003;96:247-54. Martinez-Samano JTP, Rez-Oropeza MA, Elias-Vinas D, Verdugo-Díaz L. Effects of acute electromagnetic field exposure and movement restraint on antioxidant system in liver, heart, kidney and plasma of Wistar rats: a preliminary report. Int J Radiat Biol 2010;86:1088-94. Devrim E, Ergüder I, Kiliçoglu B, Yaykasli E, Cetin R, Durak I. Effects of electromagnetic radiation use on oxidant/antioxidant status and DNA turn-over enzyme activities in erythrocytes and heart, kidney, liver, and ovary tissues from rats: possible protective role of vitamin C. Toxicol Mech Methods 2008;18:679 6-83. Odaci E, Unal D, Mercantepe T, Topal Z, Hanci H, Turedi S, et al. Pathological effects of prenatal exposure to a 900 MHz electromagnetic field on the 21-day-old male rat kidney. Biotech Histochem 2015;90:93-101. Kinnula VL, Paakko P, Soini Y. Antioxidant enzymes and redox regulating thiol proteins in malignancies of human lung. FEBS Lett 2004;569:1-6. Sokolovic D, Djindjic B, Nikolic J, Bjelakovic G, Pavlovic D, Kocic G, et al. Melatonin reduces oxidative stress induced by chronic exposure of microwave radiation from mobile phones in rat brain. J Radiat Res 2008;49:579-86. Ozguner F, Oktem F, Ayata A, Koyu A, Yilmaz HR. A novel antioxidant agent caffeic acid phenethyl ester prevents long-term mobile phone exposure-induced renal impairment in rat Prognostic value of malondialdehyde. N-acetyl-beta-D-glucosaminidase and nitric oxide determination. Mol Cell Biochem 2005;277:73-80. Fang YZ, Yang S, Wu GY. Free radicals, antioxidants, and nutrition. Nutrition 2002;18:872-9. Martinez-Samano J, Torres-Duran PV, Juarez-Oropeza MA, Verdugo-Diaz L. Effect of acute extremely low frequency electromagnetic field exposure on the antioxidant status and lipid levels in rat brain. Arch Med Res 2012;43:183-9. Ghanbari AA, Shabani K Mohammad nejad D. protective effects of vitamin e consumption against 3MT electromagnetic field effects on oxidative parameters in substantia nigra in rats. Basic Clin Neurosci 2016;7:315-22.
de Moffarts B, Kirschvink N, Art T, Pincemail J, Lekeux P. Effect of oral antioxidant supplementation on blood antioxidant status in trained thoroughbred horses. Vet J 2005;169:65-74. Ulubay M, Yahyazadeh A, Deniz OG, Kivrak EG, Altunkaynak BZ, Erdem G, et al. Effects of prenatal 900 MHz electromagnetic field exposures on the histology of rat kidney. Int J Radiat Biol 2015;91:35-41. Ralston NVC, Ralston CR, Blackwell JL, Raymond LJ. Dietary and tissue selenium in relation to methylmercury toxicity. Neurotoxicology 2008;29:802-11. Zhang J, Zhang YH, Jiang RP, Lian ZS, Wang H, Luo R, et al. Protective effects of vitamin E against electromagnetic radiation from cell phones in pregnant and fetal rats’ brain tissues. Journal of Shandong University (Health Sciences) 2011;9:9-14. Oral B, Guney M, Ozguner F, Karahan N, Mungan T, Comlekci S, et al. Endometrial apoptosis induced by a 900-MHz mobile phone: preventive effects of vitamins E and C. Adv Ther 2006;23:957-73. Mohammadnejad D, Rad JS, Azami A, Lotfi A. Role of vitamin E in prevention of damages in the thymus induced by electromagnetic field: ultrastructural and light microscopic studies. Bulletin of the Veterinary Institute in Pulawy 2011;55:111-5. Traber MG. Vitamin E regulatory mechanisms. Annu Rev Nutr 2007;27:347-62. Wang X, Fenech M. A comparison of folic acid and 5-methyltetrahydrofolate for prevention of DNA damage and cell death in human lymphocytes in vitro. Mutagenesis 2003;18:81-6. Hardeland R, Pandi-Perumal SR, Cardinali DP. Melatonin. Int J Biochem Cell Biol 2006;38:313-6. Hardeland R. Antioxidative protection by melatonin: multiplicity of mechanisms from radical detoxification to radical avoidance. Endocrine 2005;27:119-30. Tan DX, Poeggeler B, Manchester LC, Reiter RJ. Melatonin: a potent, endogenous hydroxyl radical scavenger. Endocrine J 1993;1:57-60. DAWN Lowes, Murphy MP, Galley HF. Antioxidants that protect mitochondria reduce interleukin-6 and oxidative stress, improve mitochondrial function, and reduce biochemical markers of organ dysfunction in a rat model of acute sepsis. Anaesth 2013;110:472-80. Reiter RJ, Herman TS, Meltz ML. Melatonin and radioprotection from genetic damage: in vivo/in vitro studies with human volunteers. Mutat Res 1996;371:221-8. Reiter RJ, Herman TS, Meltz ML. Melatonin reduces gamma radiation-induced primary DNA damage in human blood lymphocytes. Mutat Res 1998;397:203-8. Shirazi A, Ghobadi G, Ghazi-Khansari M. A radiobiological review on melatonin: a novel radioprotector. J Radiat Res 2007;48:263-72. Ozguner F, Aydin G, Mollaoglu H, Gokalp O, Koyu A, Cesur G. Prevention of mobile phone induced skin tissue changes by melatonin in rat: an experimental study. Toxicol Ind Health 2004;20:133-9. 5 Are rises in Electro-Magnetic Field in the human environment, interacting with multiple environmental pollutions, the tripping point for increases in neurological deaths in the Western World?